Hey, all! I have some cool things coming your way in July as I end my quest of 365 blog posts in a row. I appreciate you for reading. 14 posts to go! It’s the 4th of July, and forgive me for saying this, but while this used to be one of my favorite days of the year, lately, the bravado and pride in my country has slowly diminished, leaving me close to seeing this as just another Wednesday. At Denver Comic Con this year, I picked up Puerto Rico Strong, an amazing 200+ page graphic novel telling the 40+ stories of over 50+ artists. 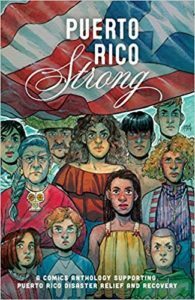 All of these stories circle around the amazing people of Puerto Rico, and all proceeds from the book are going to the United Way of Puerto Rico’s Early Childhood Relief program to provide hope for children and families affected by Hurricane Maria. While there are many reasons to feel jaded these days, a good chunk of my dismay comes at the way our government handled/is handling the hurricane relief in Puerto Rico. To this day thousands of Puerto Rico residents are still without power, even as we move back into another hurricane season. Our president called them “too rich” for more aid and tossed rolls of paper towels into a crowd of suffering Americans. Yes, Americans. 50% of Americans do not know that Puerto Rico has been an American territory since 1898, given to us by Spain after the Spanish-American War. And while the people of Puerto Rico have fought for America in every single war since we were given this nation of people (if you can be given a nation of people), they cannot vote for president, and we have left thousands without the basic necessities of life for over nine months. These people have fought and died for the American flag. Generations of Puerto Ricans have worn the coveted U.S. Military uniform, thousands losing their lives for this country, and we can’t get them power and water. Where is the outrage in that?? The people of Puerto Rico are amazing. Rich in culture and pride. Resilient after centuries of colonization and abuse. And we deemed those Americans, that have died for our flag for generations “too rich” for aid. So forgive me for not feeling the sense of pride that I used to feel lighting snakes on the South Side streets of Chicago as a kid. And yeah, I might not have been as politically and socially aware even a few years ago to call out the hypocrisy of past administrations as I am now, but I also understand that the fact that I can write something like this with the free-est of speech makes me one of the luckiest people on the planet. So much of what makes this country great is all around us. It’s hard to see sometimes. I think the people of Puerto Rico exemplify the drive and determination that we need to get back to a place where we care about people again. This book is a prime example of why culture and caring for each other is pinnacle. Get it. Read it. Care for each other in ways that might work against your political beliefs. We are all humans. I don’t want you going without the basic needs to survive, and I hope you don’t want that for me either. Let’s make the 4th of July great again. Happy Birthday, America!